I don't like wasting food that I've purchased, so I took inventory of the fridge, and after last weeks Sunday veggie haul and the first delivery of my CSA box (Community Supported Agriculture), I didn't need much this week. I always need onions, carrots, celery and cabbage, so I only added, italian broccoli, green garlic, turnips w/greens, watermelon and daikon radish, and 2 bunches collard greens. I still have 1 head of escarole, parsnips, and, up until about 1pm, 3 small butternut squashes from my CSA box. I loved, loved, loved the green garlic so much ( I had never used it before) that I bought some more at the FM this morning. I peeled the parsnips for a puree I never did yesterday, so I'll finish that up tomorrow, and maybe chop some parsley and chives to mix in (?). Mark ate 1/2 of a butternut and the rest will be eaten on it's own, or in soup. I was so busy this last season trying all sorts of different squashes, ( thanks to Fawn Friday), that I think I only bought one butternut! I made Fawn's Citrus Dressing, so I'll tear up the escarole for some sort of salad, and then I'll be ready for another delivery on Wednesday. I used the end of the radishes (plus greens, 2 bunches from the market and 1 bunch from CSA) for a quick saute w/brown rice, quinoa, and chicken for my first meal of the day. I used about 2 t. olive oil and then splashed some rice vinegar and fish sauce for seasonings. You really do have to stay on top of your veggies when they are from the Farmer's Market or CSA... those guys don't irradiate their food like some of the big produce companies. One reason why I buy green top beets and carrots... they last longer. Excellent message and nice pictures like always Tracy! Hi Tracy, Your food pictures always look like a beautiful painting! I wanted to post and say thank you for sharing yourself with others through your blogging. You have inspired me beyond words. 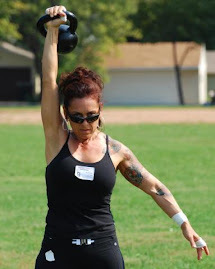 In fact, I'm taking my first kettlebell class with Doug Nepodal tonight! We are so fortunate that he moved to California and is teaching a class in Santa Barbara! YAY! I'm also inspired by your cooking and love for food...no more boring dry chicken breasts and broccoli for me! (I have to admit that I like it once in a while).. but my husband thanks you too.. I roasted a turkey last night in our Showtime Rotissarie (sp) and bought myself a pressure cooker (still figuring that sucker out!) So life IS good..and you've helped me make ours taste better again too! I wouldn't dream of buying beets without the tops...that's the best part, Now if you could do something with carrot tops! I researched like crazy once, and nothing seemed appealing. You are fortunate to have Doug....have fun, lol! I can't tell you how happy it makes me to hear how you've been inspired to cook with more diversity. Your timing is perfect, because I'm getting ready to blog alot more about food and my thoughts on the subject of eating and diet. Stay tuned!